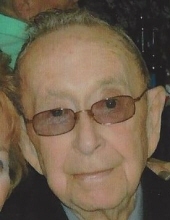 Wilson, Raymond L.- Age 89, of Waters, Michigan passed away on Monday, September 10, 2018 at Genesys Hospital Grand Blanc, Mi. Funeral services will be held 12PM Friday, September 14 at Sharp Funeral Home & Cremation Center 6063 Fenton Rd. Flint. Visitation will be held 1- 8PM Thursday at the funeral home.Those desiring may make contributions to the Alzheimer's Association. Raymond was born March 17, 1929 the son of Marion Jess and Jimmie Dewey (Long) Wilson in Nettleton (Jonesboro), Arkansas. He married Dorothy J. Trigger on June 19, 1954 at Parkland Presbyterian Church in Flint. She preceded him in death on May 27, 2018. He moved from Arkansas to Flint, Mi. to start work at GM Chevy in the hole. Raymond got his 90 days in at GM and then was drafted to the Korean War. After returning from the Korean War he went back to work at Chevy in the hole until he transferred over to the V8 Engine plant on VanSlyke Rd. where he worked until retiring in 1985. Upon retiring from GM Raymond and his wife moved up north to Waters, Mi. where he resided until his death. Raymond is survived by his children: Raymond R. (Julie) Wilson, Debbi (Randy) Osterman, Tom Wilson, Tim (Roberta) Wilson, Sherry (Lenny) Myers, Deanie (Billy) Brooks, Cathy Ferris, Mark (Patsy) Wilson; 14 grandchildren; 12 great-grandchildren; He is also survived by his brothers: Albert and Jimmy Wilson; sister-in-law's Mary Ann Trigger, Thelma Brown and Phyllis (Don) Ellis; He also leaves many nieces, nephews and friends. Besides his beloved wife; Raymond was preceded by his beloved twin grandsons, Trevor and Travis Wilson; parents; four brothers, Jessie, Earl, Lester, Opie; two sisters, Marie Wiley and Margaret Cooper; mother-in-law, Mary Trigger; in-laws, Joan and Denny Wilbur. Jim Trigger, Norbert Trigger, Buck and Betty Trigger, Pete and Donna Trigger, Chuck Brown, Bob Trigger. Tributes may be shared on the obituaries page of www.sharpfuneralhomes.com. To send flowers or a remembrance gift to the family of Raymond Wilson, please visit our Tribute Store. "Email Address" would like to share the life celebration of Raymond Wilson. Click on the "link" to go to share a favorite memory or leave a condolence message for the family.